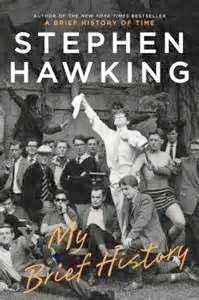 Philosophy of Science Portal: Hawking's "Brief History"
"Stephen Hawking: My Brief History"
In this exclusive extract from his memoir, Stephen Hawking reveals the secrets of his journey from so-so pupil to cosmic megastar. My earliest memory is of standing in the nursery of Byron House School in Highgate and crying my head off. All around me, children were playing with what seemed like wonderful toys, and I wanted to join in. But I was only two-and-a-half, this was the first time I had been left with people I didn’t know, and I was scared. I think my parents were rather surprised at my reaction, because I was their first child and they had been following child development textbooks that said that children ought to be ready to start making social relationships at two. But they took me away after that awful morning and didn’t send me back to Byron House for another year-and-a-half. Shortly after returning, I remember complaining to my parents that the school wasn’t teaching me anything. The educators at Byron House didn’t believe in what was then the accepted way of drilling things into you. Instead, you were supposed to learn to read without realising you were being taught. In the end, I did learn to read, but not until the fairly late age of eight. My sister Philippa was taught to read by more conventional methods and could read by the age of four. But then, she was definitely brighter than me. I was never more than about halfway up the class. My classwork was very untidy, and my handwriting was the despair of my teachers. But my classmates gave me the nickname Einstein, so presumably they saw signs of something better. When I was 12, one of my friends bet another friend a bag of sweets that I would never amount to anything. I don’t know if this bet was ever settled, and if so, which way it was decided. I had six or seven close friends, most of whom I’m still in touch with. We used to have long discussions and arguments about everything from radio-controlled models to religion and from parapsychology to physics. One of the things we talked about was the origin of the universe and whether it had required a God to create it and set it going. 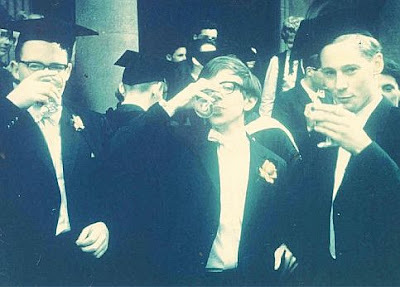 I won a scholarship to Oxford in 1959 and went up when I was 17. At that time, the physics course was arranged in a way that made it particularly easy to avoid work. I once calculated that I did about a thousand hours’ work in the three years I was there, an average of an hour a day. I’m not proud of this lack of work, but at the time I shared my attitude with most of my fellow students. We affected an air of complete boredom and the feeling that nothing was worth making an effort for. Because of my lack of preparation, I had planned to get through the final exam by doing problems in theoretical physics and avoiding questions that required factual knowledge. I didn’t sleep the night before the exam because of nervous tension, however, so I didn’t do very well. I was on the borderline between first- and second-class degrees, and I had to be interviewed by the examiners to determine which I should get. In the interview they asked me about my future plans. I replied that I wanted to do research. If they gave me a first, I told them, I would go to Cambridge. If I only got a second, I would stay in Oxford. They gave me a first. During that last year in Oxford I had noticed that I was getting increasingly clumsy. I went to the doctor after falling down some stairs, but all he said was, “Lay off the beer.” I became even more clumsy after moving to Cambridge. At Christmas, when I went skating on the lake at St Albans, I fell over and couldn’t get up. My mother noticed these problems and took me to the family doctor. He referred me to a specialist, and shortly after my 21st birthday I went into the hospital for testing. They took a muscle sample from my arm, stuck electrodes into me, and then injected some fluid into my spine and, with X-rays, watched it go up and down as they tilted the bed. After all that, they didn’t tell me what I had except for saying that I was an atypical case. I gathered, however, that they expected it to continue to get worse and that there was nothing they could do except give me vitamins. The realisation that I had an incurable disease that was likely to kill me in a few years was a bit of a shock. How could something like this happen to me? I felt somewhat of a tragic character. I took to listening to Wagner, but reports in magazine articles that I also drank heavily at that time are an exaggeration. My dreams, however, were rather disturbed. Shortly after I came out of the hospital, I dreamed that I was going to be executed. I suddenly realised that there were a lot of worthwhile things I could do if I was reprieved and I started to find, to my surprise, that I was enjoying life. What really made the difference was that I got engaged to a girl called Jane Wilde, whom I had met about the time I was diagnosed with motor neurone disease. If we were to get married I had to get a job, and to get a job I had to finish my PhD. I therefore started working for the first time in my life and, to my surprise, I found I liked it. I applied for a research fellowship at Caius College and between 1965 and 1970 worked with two colleagues to develop a theory about the origins of the universe. Thanks partly to this work, I was elected a fellow of the Royal Society in 1974 and promoted to professor in 1977. Five years later, I decided to write a popular book about the universe. My intention was partly to earn money to pay my daughter’s school fees, but, mainly, I wanted to explain how far I felt we had come in our understanding of the universe: how we might be near to finding a complete theory that would describe the universe and everything in it. At this time I used a computer program called Equalizer which allowed me to select words from a series of menus on the screen by pressing a switch in my hand. If I was going to invest so much time and effort into writing a book, I wanted it to get to as many people as possible. I therefore contacted a literary agent, Al Zuckerman. I gave him a draft of the first chapter and explained that I wanted it to be the sort of book that would sell in airport bookstores. He told me there was no chance of that. It might sell well to academics and students, he said, but a book like that couldn’t break into Jeffrey Archer territory. I gave Zuckerman a first draft of the book in 1984. He sent it to several publishers and recommended that I accept an offer from Norton, a fairly upmarket American book firm. But I decided instead to take an offer from Bantam Books, a publisher more oriented towards the popular market. Bantam’s interest in the book was probably due to one of their editors, Peter Guzzardi. He took his job very seriously and made me rewrite the book so that it would be understandable to non-scientists such as himself. Each time I sent him a rewritten chapter, he sent back a long list of objections and questions he wanted me to clarify. At times I thought the process would never end. But he was right: it is a much better book as a result. Even so, Bantam was taken by surprise by the demand for the book. It was on The New York Times bestseller list for 147 weeks and on The Times bestseller list for a record-breaking 237 weeks, has been translated into 40 languages, and has sold more than 10 million copies worldwide. Why did so many people buy it? Undoubtedly, the human interest story of how I’d managed to be a theoretical physicist despite my disability helped. Second was the title: my original was “From the Big Bang to Black Holes: A Short History of Time”, but Guzzardi turned it around and changed “Short” to “Brief”. It was a stroke of genius. There have been many “brief histories” since, and even A Brief History of Thyme. Imitation is the sincerest form of flattery. It has also been suggested that many people bought the book to display on the bookcase or on the coffee table, without having actually read it. I am sure this happens, though I don’t know that it is any more so than with most other serious books. I do know that at least some people must have waded into it, because each day I get a pile of letters about that book, many asking questions or making detailed comments that indicate that they have read it, even if they do not understand all of it. And, finally, I think sales might have been halved if I had cut, as I nearly did in the proof stage, the last sentence of the book: that, if we ever find a complete unified theory, “it would be the ultimate triumph of human reason, for then we would know the mind of God”. Today, I am possibly the best-known scientist in the world. This is partly because scientists, apart from Einstein, are not widely known rock stars, and partly because I fit the stereotype of a disabled genius. My disability has not been a serious handicap in my scientific work and I have managed to do most things I wanted. I have met the presidents of South Korea, China, India, Ireland, Chile and the United States. I have lectured in the Great Hall of the People in Beijing and in the White House. I have been under the sea in a submarine and up in a hot-air balloon and I’m booked to go into space with Virgin Galactic. It has been a glorious time to be alive and doing research in theoretical physics. I’m happy if I have added something to our understanding of the universe.